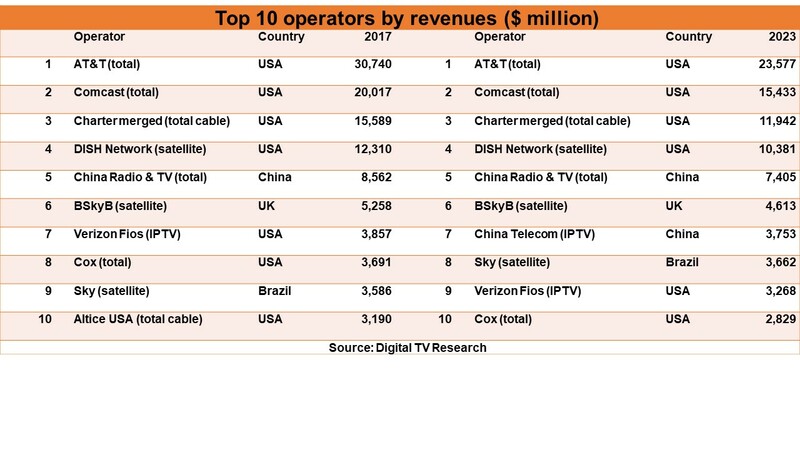 Taking a broad look at the 517 pay TV providers around the globe, Digital TV Research sees total revenues dropping by $18 billion from 2017 to 2023 when the market will be worth $183 billion. Two main patterns account for the drop: Subscribers in more developed countries are increasingly turning away from pay TV and toward streaming options, and if they stay with pay TV they're signing up for money-saving bundles. Focusing on just the top ten largest pay TV providers, Digital TV Research sees a revenue drop of $20 billion. In 2017, the ten largest players accounted for 53 percent of the total revenue; in 2023 they'll account for 48 percent. "Cord-cutting is a well reported problem in the U.S.," notes Simon Murray, principle analyst at Digital TV Research. "It is happening in some other countries too, but not that many. So there are fewer big spending subscribers in the U.S. and more low-spending subscribers in developing markets such as India and China." As spending patterns change, 5 pay TV operators (including 4 from the U.S.) will lose over $1 billion in revenues from 2017 to 2023, while 15 operators will add over $100 million to their revenues in the same period. "In developed countries, subscribers are paying less on TV services. This is partly due to cord-cutting but also because more homes are moving to bundles (where subscribers pay more overall but less on TV services)," Murray adds. "This shows how important the broadband connection has become for most homes."